Ah, winter. The hustle and bustle of the fall harvest is behind us, and we hopefully preserved enough salsa, pasta sauce and other summer goodies to tide us over through the colder months. 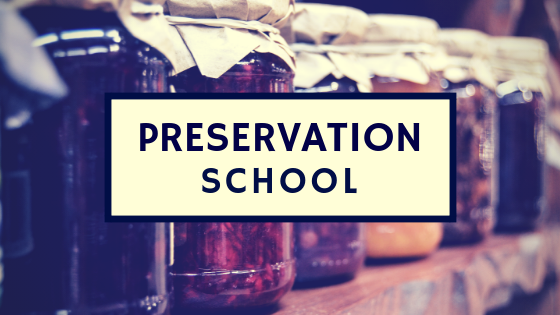 Many people have packed up their canning gear and empty jars and stowed them away in the basement until next summer. But you don’t have to! I love canning and preserving, so packing away my gear never really happens – it’s just part of my kitchen landscape. Cabbage – we love making sauerkraut! Cauliflower – pickled cauliflower is really tasty and is something different on appetizer platters. Apples – applesauce, apple butter, pie filling, you name it. Garlic – pickled garlic is great to have on hand, or it can be used to make infused oil or vinegar. And while not local to northern Illinois, winter is the season for citrus. You can buy citrus directly from small farmers on sites like Local Harvest. And you can do so much with it – marmalade, dehydrated zest for baking, extracts, liqueurs, and so much more. Wine jelly – this is a delicious accompaniment to roasted meat. Mustard – can’t be beat with sausages and roasted meat dishes in the winter, and can be made in a variety of flavors and styles. Flavored oil – garlic and rosemary flavored is a household staple. Flavored vinegar – wonderful mixed with flavored oil for home made vinaigrette. Cider jelly – great in sweet and savory dishes, but especially tasty on thumb print cookies! So while it’s fine to slow down and take a break from preserving in the winter if you want to (you earned it!) you certainly don’t have to pack away the canning pot. There are many easy and delicious things to can up in the cold season! ← Jam, Jelly- What’s the Difference?